“Freddie” is the only son of Geoffrey and Winifred Mills who live in a beautiful mansion house near Thornbury. With a keen interest in the works of Kipling, geography and the Empire it was only natural that Freddie was destined to travel to distant lands. Educated at Clifton College and then Cambridge, Freddie became firm chums with Francis Bingham. The Binghams had long been family friends often meeting at gatherings at the Cave’s home at Cleve Hill House near Frenchay. An energetic young man, his love of horses and polo put him in high regard among the social circle he had been born into. Having gained a degree in English and Classics from Cambridge, Freddie went on to Sandhurst to fulfil his dream of becoming a cavalry officer in the British Army. 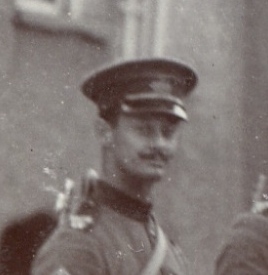 He passed out with distinction before setting off for India as a lieutenant in the Gloucestershire Regiment. Freddie had married Grace after a whirlwind romance and they had one daughter, Lottie. Both decided to stay in England during Freddie’s tour in India and regularly write to each other enclosing photographs and keepsakes. As an officer in the 20th Deccan Horse, Freddie became well respected by his Indian troops and by 1914 they had been ordered to France as part of the 9th (Secunderabad) Cavalry Brigade. Nothing could prepare the Indian Army for modern warfare on the Western Front, and in 1916 they were soon to become part of the first and last cavalry charge of the Battle of the Somme.